Nothing is more devastating for a small child than seeing their balloon accidentally drift away. 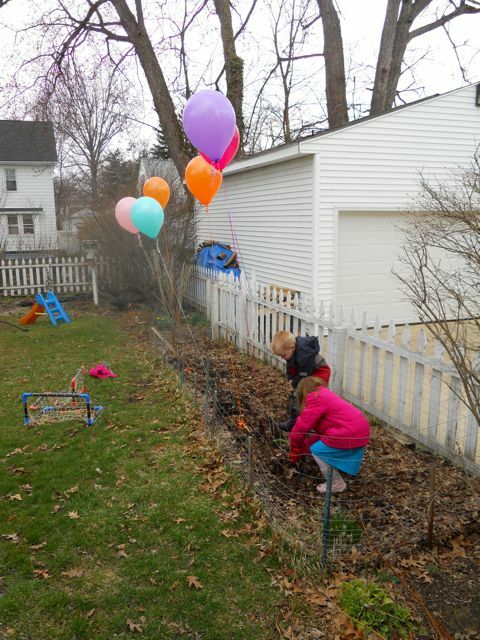 I remember my daughter's 4th birthday party when she released a balloon that was attached to a gift. It was tragic to watch the balloon disappear. The tears continued to flow even after the balloon was gone. 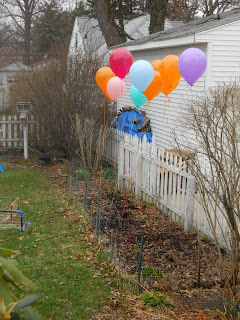 Jerdine Nolen's motto is "Hold fast to your dreams as you would your balloons." As a parent, her motto made me think about the importance of keeping my children's dreams securely fastened and safe so they don't drift away or accidentally pop. My daughter often says she wants to be a teacher, an artist, or an author. 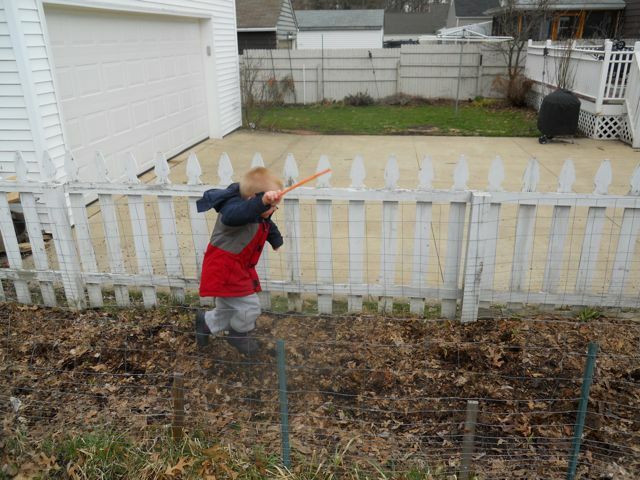 My son says he wants to be a superhero or a veterinarian. These dreams may come from small children but they are as big and as precious as a brightly colored balloons. 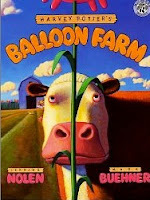 Harvey Potter's Balloon Farm was Jerdine Nolen's first published book in 1998. It is a magical story about a young girl who develops "quite an interest" in Harvey Potter, his mysterious conjure stick he carries under his arm everywhere he goes, and his Balloon Farm. Harvey Potter isn't forthcoming with his secret of growing the inflatable crop when he and the young girl hang out on his big porch swing sipping lemonade. Over time the young girl wants to find out what everyone else in the town is dying to know: What does Harvey Potter use for his seeds? She decides to hide in a sycamore tree under a full moon to learn once and for all how the balloons are grown on the farm. She observes how the magic of balloon is born. After reading this with my children, I proposed the idea of growing our own balloon micro-farm in our garden area. There was curiosity in their eyes and smiles on their faces. When the words came out of my mouth I can honestly say that I really didn't know if it would work. But, my daughter gave an immediate suggestion for keeping the balloons in the ground. It seemed possible. Unfortunately, it rained non-stop the next day, but the weather forecast promised the following day would be cool but dry. The weather did slightly improve the following day, just enough to make a trip to the party supply store to get everything we needed to try balloon farming. My daughter also danced and yelled "Eeeeeeeee YaYaYaYaYa"
not acquire these at the party store). Then, the balloon farmers covered the bean poles with dirt. we are successful Balloon Farmers! 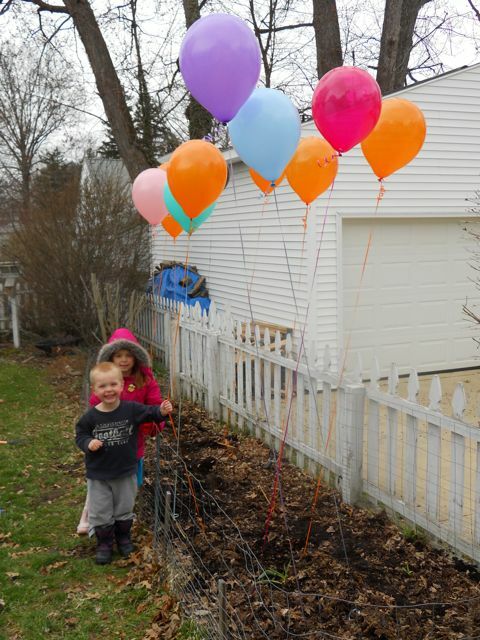 Our balloon farm brings a smile to our faces on a cold and dreary April day. There is a wonderful interview with Jerdine Nolen posted on The Brown Bookshelf. She spoke of her childhood "collection" of words. "I collected words because I liked the way certain words sounded, what they meant, how they made me laugh because they sounded so silly." She continued the story, "My mother gave me an empty cardboard cigar box. Then, we made what would be the equivalent of index cards (the cardboard from my dad's shirts from the dry cleaner, cut to size)." I thought this would be an excellent activity for my children too. 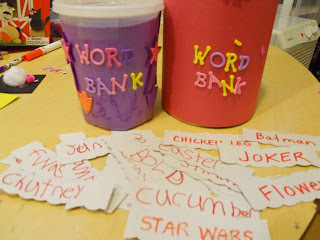 I didn't have any boxes that were of an appropriate size, but I did have a few other food containers that allowed us to make "Word Banks". I made lots of little cards but they were all used by the end of the day. 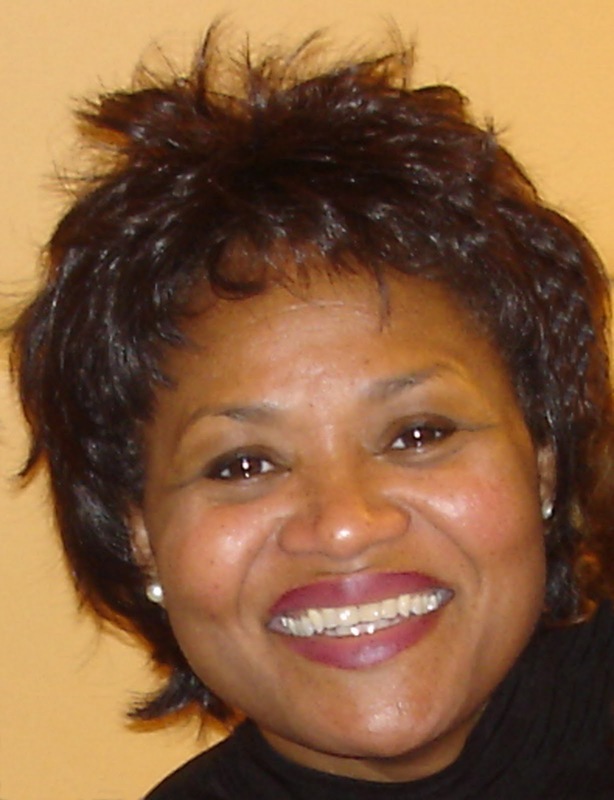 We included Jerdine Nolen's favorite words from her childhood "Cucumber" and "Chutney". I'm hoping my daughter keeps the enthusiasm she has had the past few days for the "Word Banks" . Nolen described her enthusiasm in this way for her word box, "It was my great treasure. If I ever needed to be entertained, or have a big belly laugh, I would look at my word supply." My daughter has added words such as devour, aisle and divine to her word bank since we started this just a day ago! As a child, I loved the fact that I was born in April and springtime. Even now, at this age, I still feel happy at the prospect of my birthday. Everything is reborn. The world is so fresh and new and green. Crocus, daffodils, chirping and singing robins all return to grace the Earth, just before the Easter Bunny hops around. One of my happiest birthday memories is when I turned six years old. Because my birthday falls in the wonderful month of April, once in my childhood, I got lucky. I shared the day with Easter. Even as a child, I knew Easter had more than to do with colored eggs and the Easter Bunny, but still, I always hoped and prayed and each year that I would be lucky. At the age of six, I got that wish to share my birthday with Easter. That birthday was the most special birthday because besides the big Easter Sunday celebration at church, we also had a birthday celebration at home for me. My mother baked a six-layer cake for my birthday dinner party. Each layer was a different color. I remember when my mother proudly cut the cake to reveal it's yummy magic. There was a series of ooohhhs and awwwws around the table as she handed me my plate with the first piece. I remember thinking, what a lucky girl I am to have such a cake. To see each color stacked on top of the other was amazing. It was beautiful. It was magical. I remember looking up at my mother and smiling as I reached for my piece. The truth was, after eating so many Easter eggs and jelly beans, I had no appetite for cake. Jerdine, thank you so much for sharing your birthday memory. My family really enjoyed reading many of your books this week. We hope you have a wonderful and relaxing birthday! We've lost our share of balloons to the sky, too. The Balloon Farm idea sounds like a good one. 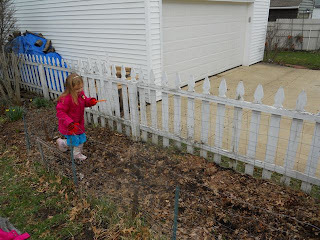 That's about all we'd get to grow outside in our area right now. I love the word bank idea! I think I might start that with Aidan and Abigail next week. Do you just use the words some way and once you use them put them in the jar? Have you done it every day? Thanks, Eric! Initially, we made the “word bank” along a bunch of blank cards. I thought the amount of cards that I made would last her a while, but she independently added word after word until all the cards were gone. Since then, if a cool word comes up – we all kinda look at each other and know that it would a cool word to add to the bank. So, there is no set schedule to it. It’s her word bank and she is in control. But, I did make her some more blank cards today to keep her going. As far as using the words – in an activity, no. When I read about the idea from Nolen, I liked that she said that she would return to the words when she wanted to laugh. So, at this point it is just a collection of words – nothing more, nothing less; very similar Nolen. But, I certainly see how we could pull out the words later and do lots of fun things with them.